Objectives: The objective of the study is to investigate the role of basic fibroblast growth factor (bFGF) in sensitivity to cisplatin in non-small cell lung cancer (NSCLC) A549 cells and its effect on the stemness characteristics of NSCLC cells, revealing possible mechanisms of cisplatin resistance. Materials and Methods: After A549 cells were treated with cisplatin, bFGF protein expression was analyzed by Western blot. A549 cells were transfected with bFGF small interfering RNAs (siRNAs), and the knockdown efficiency was confirmed by quantitative reverse transcription polymerase chain reaction and Western blot. After bFGF downregulation, A549 cell proliferation was assessed by Cell Counting Kit-8 assay. The effect of bFGF siRNA on the sensitivity to cisplatin was evaluated by cell viability assays and flow cytometry for cell apoptosis. Colony formation assay was performed to explore whether bFGF affected the stemness characteristics of A549 cells, and OCT-4 protein expression was analyzed by Western blot after bFGF siRNA treatment. Results: Cisplatin treatment enhanced bFGF expression in A549 cells. After A549 cells were transfected with bFGF siRNAs, bFGF expression was significantly decreased compared to that in the negative control siRNA group. In addition, bFGF knockdown inhibited A549 cell proliferation. bFGF siRNA treatment enhanced the inhibitory effect of different concentrations of cisplatin on cell viability and promoted cisplatin-induced apoptosis in A549 cells. Further analyses showed that bFGF siRNA treatment not only significantly decreased colony formation in A549 cells but also downregulated OCT-4 protein expression. Conclusion: bFGF decreased NSCLC sensitivity to cisplatin in vitro, while it enhanced colony formation ability and increased OCT-4 expression of A549 cells, which might account for its involved mechanisms of cisplatin resistance. Lung cancer is one of the most commonly diagnosed cancers and the leading cause of cancer-related death in China and worldwide., Non-small cell lung cancer (NSCLC) accounts for approximately 85% of all newly diagnosed lung cancer cases, and most patients are diagnosed with advanced stage disease. Although significant advances have been made in the treatment of patients harboring driver mutations, systemic chemotherapy is still the mainstay treatment for patients without targetable driver mutations. Platinum-based doublet chemotherapy is the standard of care and has improved survival in patients with NSCLC. However, most patients experience treatment failure because of resistance to platinum chemotherapy. Therefore, identifying factors that contribute to the development of platinum resistance is of great importance. Basic fibroblast growth factor (bFGF), also known as FGF-2, is a heparin-binding growth factor, and with binding to its receptors FGFR1, FGFR2, and FGFR3, bFGF has been found to promote tumor cell proliferation and invasion in various cancers through its angiogenic and antiapoptotic properties. Meta-analysis has shown that bFGF overexpression is associated with worse prognosis in patients with NSCLC. However, whether bFGF is involved in response to platinum-based chemotherapy has not yet been fully elucidated. Cancer stem cells (CSCs) are not only capable of initiating, maintaining, and spreading cancer through transcription factors essential to maintain pluripotency and self-renewal, such as OCT-4,, but also important resources of resistance to chemotherapy., Researches have revealed that bFGF plays important roles in maintaining the stemness of normal stem cells, such as embryonic stem cells and mesenchymal stem cells., bFGF is also essential for phenotype and genotype maintenance of CSCs. In this study, we evaluated whether bFGF modulates the sensitivity of A549 NSCLC cells to cisplatin, one of the most widely used platinum drugs, by in vitro experiments. The effect of bFGF on the stemness characteristics of NSCLC cells was further analyzed, which might reveal the possible mechanisms of resistance to cisplatin. A549 cells were cultured in RPMI-1640 medium (Hyclone, Logan, USA) supplemented with 10% fetal bovine serum (TBD, Tianjin, China) at 37°C in a humidified atmosphere with 5% CO2 and were passaged every 2–3 days. A549 cells were treated with cisplatin (5 μg/mL) or phosphate-buffered solution (PBS) for 48 h and then harvested for subsequent assays. The collected A549 cells were washed with cold PBS, lysed in RIPA lysis buffer for 30 min, and concentrated at 12,000g at 4°C for 5 min. The protein concentration was quantified by the Enhanced BCA Protein Assay Kit (Beyotime, Shanghai, China). Proteins (50 μg) were electrophoresed with 15% (for bFGF) or 10% (for OCT-4 and β-actin) SDS–PAGE gel and transferred onto polyvinylidene difluoride membranes. The membranes were blocked with 5% fat-free milk for 2 h at room temperature, followed by overnight incubation with diluted primary antibodies at 4°C and then with the secondary antibodies for 1 h at 37°C. The antibodies were diluted as follows: bFGF (sc-79, Santa Cruz, CA, USA), 1:250; OCT-4 (ab19857, Abcam, MA, USA), 1:1000; β-actin (ab1801, Abcam, MA, USA), 1:1000; horseradish peroxidase-conjugated goat-anti-rabbit secondary antibody (Zsbio, SB200), 1:5000. Thereafter, the membranes were immersed in ECL fluid for 3 min, and then, the films were developed and fixed for visualization according to the manufacturer's instructions. The relative integral optical density was used to measure the expression of each sample. Two small interfering RNAs (siRNAs) specific for bFGF (bFGF siRNA-1 and bFGF siRNA-2) and negative control (NC) siRNA were synthesized by GeneChem (Shanghai, China). A549 cells were seeded in 6-well plates 1 day before transfection, and siRNA transfection was carried out using NanoFectin transfection reagents (GE Healthcare, USA) according to the manufacturer's instructions. After 6 h, the cells were washed and cultured in normal growth medium. The A549 cells were collected 48 h after transfection for quantitative reverse transcription polymerase chain reaction (qRT-PCR) and Western blotting. Cell proliferation assay was performed at indicated time points. Total RNA was extracted from A549 cells using Trizol reagent (Invitrogen, Carlsbad, CA, USA), and 500 ng of total RNA was subjected to reverse transcription with the PrimeScript RT Reagent Kit (TaKaRa, Tokyo, Japan) for cDNA synthesis. qRT-PCR was carried out with LightCycler FastStart DNA Master SYBR Green I kit following the manufacturer's instructions (Roche Diagnostics, Indianapolis, IN, USA), and the data were analyzed by LightCycler software (Roche Diagnostics, Indianapolis, IN, USA). GAPDH was used as an internal control, and the relative mRNA expression of bFGF was normalized by GAPDH. The primers were designed and synthesized by BioSune Biotechnology (Shanghai, China) and their sequences were as follows: bFGF forward 5′-AGTGTGTGCTAACCGTTACCT-3′, reverse 5′ ACTGCCCAGTTCGTTTCAGTG-3′; OCT-4 forward 5′-GGGCTCACCCTGGGGGTTCT-3′, reverse 5′-ACTTCTGCAGCAAGGGCCGC-3′; and GAPDH forward 5′-ATGGGGAAGGTGAAGGTCG-3′, reverse 5′-GGGGTCATTGATGGCAACAATA-3′. Cell viability was assessed by Cell Counting Kit-8 (CCK-8) (BestBio, Shanghai, China) following the manufacturer's instructions. In brief, A549 cells were plated at 1 × 103 cells/well in 96-well plates and cultured overnight. At scheduled time points, 10 μL of CCK-8 solution was added into each well and incubated at room temperature for 4 h. The absorbance at 450 nm was measured using a microplate reader (Bio-Rad, Hercules, CA, USA). Results were the representative of three individual experiments in triplicate. For cell growth curve analysis, cell viability was measured every 24 h for 6 days. In the cisplatin sensitivity assay, different concentrations of cisplatin (2.5, 5, and 10 μg/mL) or PBS controls were added in each group, and cell viability was assessed after 48 h.
The apoptosis of A549 cells induced by bFGF siRNA and/or cisplatin was assessed by flow cytometry using the Annexin V-FITC Assay Kit (BD Biosciences, San Diego, CA, USA) according to the provided protocol. After incubation with Annexin V-FITC and propidium iodide, fluorescence was quantified with a FACSCalibur flow cytometer (Becton Dickinson, Franklin Lakes, NJ, USA), and the data were analyzed by CellQuest software (Becton Dickinson, Franklin Lakes, NJ, USA). A549 cells were dissociated into single cells 48 h after siRNA transfection and plated in 6-well plates at a density of 100 cells/well. The cells were fixed with methanol and stained with Giemsa after 14 days of culture, and the number of colonies (containing >50 cells) was counted. The colony formation rate was calculated as the number of colonies divided by the number of plated cells. The results are presented as means ± standard deviations. The differences between experimental groups were compared using Student's t-test or Chi-square test with SPSS 18.0 software (IBM Corp, New York, USA). P < 0.05 was considered statistically significant. A549 cells were treated with 5 μg/mL cisplatin or PBS for 48 h, and bFGF protein expression in surviving cells was analyzed by Western blotting. The results showed that cisplatin treatment increased bFGF expression by 43% compared to that in the control group [P < 0.05, [Figure 1]. Since bFGF expression was upregulated by cisplatin treatment, we next explored its role in A549 cell proliferation. Specific siRNAs for bFGF (bFGF siRNA-1 and bFGF siRNA-2) were transfected into A549 cells, and bFGF expression was significantly decreased compared to that in the NC siRNA, as confirmed by qRT-PCR [Figure 2]a and Western blot [Figure 2]b. bFGF siRNA-1 showed a stronger knockdown effect and thus was utilized in subsequent analyses. After knockdown of bFGF, A549 cell proliferation was significantly inhibited [[Figure 2]c, P < 0.05]. We further investigated whether bFGF affected the sensitivity of A549 cells to cisplatin. The CCK-8 assay showed that bFGF siRNA treatment enhanced the inhibitory effect of different concentrations of cisplatin (2.5, 5, and 10 μg/mL) on cell viability [Figure 3]a. bFGF siRNA itself did not increase the cell apoptosis rate compared to NC siRNA. However, it markedly promoted cisplatin-induced apoptosis in A549 cells [Figure 3]b, 26.67% ± 2.59% vs. 9.05% ± 1.20%, P < 0.05]. These results suggested that the downregulation of bFGF increased A549 cell sensitivity to cisplatin. CSCs are one of the main contributors to chemoresistance, the stemness characteristics of which include enhanced colony formation ability. 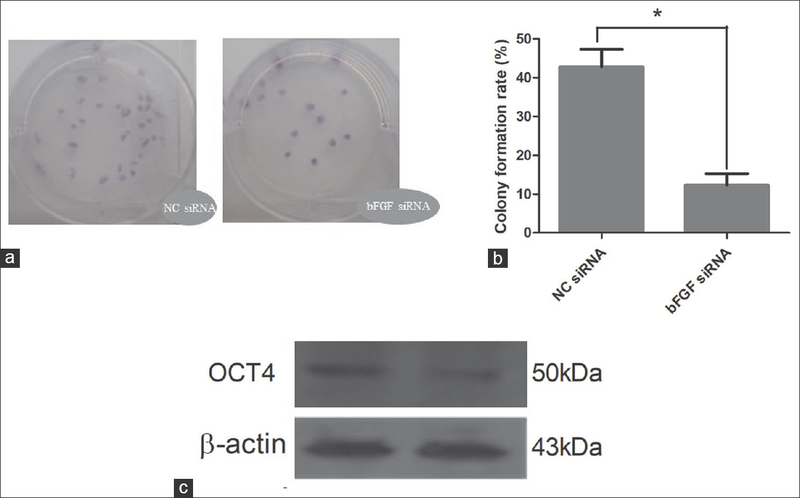 Hence, the colony-forming assay was performed, and it was found that bFGF siRNA treatment significantly decreased the colony formation rate of A549 cells [Figure 4]a and b, P < 0.05]. The protein expression of OCT-4, a key regulator in CSCs, was analyzed and the results showed that it was downregulated after transfection of bFGF siRNA [Figure 4]c.
Resistance to chemotherapy has long been a major barrier in improving the survival outcome of patients with advanced NSCLC, and much effort has been dedicated to identify molecules or pathways that contribute to chemoresistance. In this study, we found that bFGF was significantly elevated in A549 NSCLC cells after cisplatin treatment. Further analyses demonstrated that bFGF not only promoted A549 cell proliferation but also decreased the sensitivity to cisplatin. These results indicated that bFGF was an important contributor to cisplatin resistance in NSCLC. bFGF and its receptors, FGFR1, FGFR2, and FGFR3, are widely expressed in multiple cancer types. There is substantial evidence for the important role of bFGF signaling in regulating cell proliferation, apoptosis, migration, and angiogenesis in various contexts. Liu et al. found that the inhibition of bFGF impeded the activation of ERK1/2 and JAK2, reduced STAT3 phosphorylation, decreased the levels of downstream molecules cyclin-D1 and Bcl-xl, and finally, resulted in the induction of mitochondrial-related apoptosis and inhibition of cell proliferation in the glioma cell line U251. Posttranscriptional downregulation of FGF2 by microRNA-203 inhibited the proliferation and invasion of renal cancer cells. Our results also demonstrated that knockdown of bFGF expression in A549 cells by siRNA suppressed cell growth. Thus, bFGF and other FGFs are highly promising therapeutic targets for many cancers. bFGF and its downstream signaling also have potential roles in resistance to chemotherapy. The research by Fontijn et al. revealed that overexpression of bFGF was responsible for resistance against temozolomide in advanced melanoma, mediated by demethylation of the O6-methylguanine-DNA-methyltransferase promoter. bFGF expression was shown to be closely correlated with sensitivity or response to neoadjuvant chemotherapy in both breast cancer cell lines (MCF-7 and Cal51) and patients. We observed that decreasing bFGF expression sensitized NSCLC A549 cells to cisplatin treatment through cell viability and apoptosis assays, which indicated that bFGF possibly participated in cisplatin chemoresistance in NSCLC. A host of researches on cisplatin resistance have focused on genetic and epigenetic changes in cancer cells, but the results do not fully explain the mechanisms of resistance and have very limited significance in clinical practice. Along with the development of insights into CSCs, their important role in chemoresistance has emerged. The mechanisms of CSCs-related resistance include activated developmental signaling pathways, tumor microenvironmental changes, and other factors. bFGF signaling is essential for maintaining the phenotype and genotype of CSCs. Clonogenicity or colony-forming ability is one of the essential properties of CSCs. In our study, it was found that downregulation of bFGF decreased the rate of A549 colony formation, suggesting that bFGF might modulate the stemness characteristics of NCSLC. Until now, markers for identifying CSCs in NSCLC, such as CD133, remain controversial. Eramo et al. found that CD133(+) cells of lung cancer acquired tumorigenic and self-renewal potential, while the research by Meng et al. showed that CD133(+) and CD133(−) lung cancer cells contained similar proportions of cancer-initiating cells and exhibited no significant difference in the maintenance of CSC properties. OCT-4 is a key transcription factor essential for the tumor-initiating and self-renewal abilities of CSCs and is consistently expressed in multiple cancers, including NSCLC. It plays a crucial role in regulating colony formation, chemoresistance, and invasion of CD133(+) lung cancer cells. We examined whether bFGF affected OCT-4 expression in A549 cells and found that bFGF siRNA markedly suppressed the expression of OCT-4. Greber et al. also showed that bFGF stimulated the expression of OCT-4, Nanog, and Sox2 in embryonic stem cells through transforming growth factor beta signaling,,,, which was consistent with our findings. Therefore, bFGF increased OCT-4 expression in A549 cells and might further reduce their sensitivity to cisplatin. Further studies are needed to explore their interactions and confirm their role in cisplatin resistance. Taken together, our findings demonstrated that bFGF decreased A549 cell sensitivity to cisplatin in vitro, while it enhanced the colony formation ability and increased OCT-4 expression in A549 cells. These results indicate that bFGF might be involved in the mechanisms of cisplatin resistance. bFGF will thus be a promising therapeutic target for NSCLC, and more detailed in vitro and in vivo experiments are required to confirm this. This work was supported by grants from the Key Research Project Foundation of Shandong Province (No. 2017GSF18126 and No. 2016GSF201163). Chen W, Zheng R, Baade PD, Zhang S, Zeng H, Bray F, et al. Cancer statistics in China, 2015. CA Cancer J Clin 2016;66:115-32. Torre LA, Siegel RL, Jemal A. Lung cancer statistics. Adv Exp Med Biol 2016;893:1-9. Gridelli C, Rossi A, Carbone DP, Guarize J, Karachaliou N, Mok T, et al. Non-small-cell lung cancer. Nat Rev Dis Primers 2015;1:15009. Treat J, Scagliotti GV, Peng G, Monberg MJ, Obasaju CK, Socinski MA, et al. Comparison of pemetrexed plus cisplatin with other first-line doublets in advanced non-small cell lung cancer (NSCLC): A combined analysis of three phase 3 trials. Lung Cancer 2012;76:222-7. Okada-Ban M, Thiery JP, Jouanneau J. Fibroblast growth factor-2. Int J Biochem Cell Biol 2000;32:263-7. Hu M, Hu Y, He J, Li B. Prognostic value of basic fibroblast growth factor (bFGF) in lung cancer: A systematic review with meta-analysis. PLoS One 2016;11:e0147374. Clevers H. The cancer stem cell: Premises, promises and challenges. Nat Med 2011;17:313-9. Chiou SH, Wang ML, Chou YT, Chen CJ, Hong CF, Hsieh WJ, et al. Coexpression of Oct 4 and nanog enhances malignancy in lung adenocarcinoma by inducing cancer stem cell-like properties and epithelial-mesenchymal transdifferentiation. Cancer Res 2010;70:10433-44. Dean M, Fojo T, Bates S. Tumour stem cells and drug resistance. Nat Rev Cancer 2005;5:275-84. Singh A, Settleman J. EMT, cancer stem cells and drug resistance: An emerging axis of evil in the war on cancer. Oncogene 2010;29:4741-51. Levenstein ME, Ludwig TE, Xu RH, Llanas RA, VanDenHeuvel-Kramer K, Manning D, et al. Basic fibroblast growth factor support of human embryonic stem cell self-renewal. Stem Cells 2006;24:568-74. Tang WP, Akahoshi T, Piao JS, Narahara S, Murata M, Kawano T, et al. Basic fibroblast growth factor-treated adipose tissue-derived mesenchymal stem cell infusion to ameliorate liver cirrhosis via paracrine hepatocyte growth factor. J Gastroenterol Hepatol 2015;30:1065-74. Lee J, Kotliarova S, Kotliarov Y, Li A, Su Q, Donin NM, et al. Tumor stem cells derived from glioblastomas cultured in bFGF and EGF more closely mirror the phenotype and genotype of primary tumors than do serum-cultured cell lines. Cancer Cell 2006;9:391-403. Chang A. Chemotherapy, chemoresistance and the changing treatment landscape for NSCLC. Lung Cancer 2011;71:3-10. Turner N, Grose R. Fibroblast growth factor signalling: From development to cancer. Nat Rev Cancer 2010;10:116-29. Liu J, Xu X, Feng X, Zhang B, Wang J. Adenovirus-mediated delivery of bFGF small interfering RNA reduces STAT3 phosphorylation and induces the depolarization of mitochondria and apoptosis in glioma cells U251. J Exp Clin Cancer Res 2011;30:80. Xu M, Gu M, Zhang K, Zhou J, Wang Z, Da J, et al. MiR-203 inhibition of renal cancer cell proliferation, migration and invasion by targeting of FGF2. Diagn Pathol 2015;10:24. Babina IS, Turner NC. Advances and challenges in targeting FGFR signalling in cancer. Nat Rev Cancer 2017;17:318-32. Fontijn D, Adema AD, Bhakat KK, Pinedo HM, Peters GJ, Boven E, et al. O6-methylguanine-DNA-methyltransferase promoter demethylation is involved in basic fibroblast growth factor induced resistance against temozolomide in human melanoma cells. Mol Cancer Ther 2007;6:2807-15. Shen DW, Pouliot LM, Hall MD, Gottesman MM. Cisplatin resistance: A cellular self-defense mechanism resulting from multiple epigenetic and genetic changes. Pharmacol Rev 2012;64:706-21. Batlle E, Clevers H. Cancer stem cells revisited. Nat Med 2017;23:1124-34. Cojoc M, Mäbert K, Muders MH, Dubrovska A. A role for cancer stem cells in therapy resistance: Cellular and molecular mechanisms. Semin Cancer Biol 2015;31:16-27. Visvader JE, Lindeman GJ. Cancer stem cells in solid tumours: Accumulating evidence and unresolved questions. Nat Rev Cancer 2008;8:755-68. Eramo A, Lotti F, Sette G, Pilozzi E, Biffoni M, Di Virgilio A, et al. Identification and expansion of the tumorigenic lung cancer stem cell population. Cell Death Differ 2008;15:504-14. Meng X, Li M, Wang X, Wang Y, Ma D. Both CD133+ and CD133-subpopulations of A549 and H446 cells contain cancer-initiating cells. Cancer Sci 2009;100:1040-6. Chen YC, Hsu HS, Chen YW, Tsai TH, How CK, Wang CY, et al. Oct-4 expression maintained cancer stem-like properties in lung cancer-derived CD133-positive cells. PLoS One 2008;3:e2637. Greber B, Lehrach H, Adjaye J. Fibroblast growth factor 2 modulates transforming growth factor beta signaling in mouse embryonic fibroblasts and human ESCs (hESCs) to support hESC self-renewal. Stem Cells 2007;25:455-64. Kuribayashi K, Funaguchi N, Nakano T. Chemotherapy for advanced non-small cell lung cancer with a focus on squamous cell carcinoma. J Cancer Res Ther 2016;12:528-34. Ahmed I, Ferro A, Baby R, Malhotra J, Cohler A, Langenfeld J, et al. Modern induction chemotherapy before chemoradiation for bulky locally-advanced nonsmall cell lung cancer improves survival. J Cancer Res Ther 2016;12:952-8. Saad AS, Ghali RR, Shawki MA. A prospective randomized controlled study of cisplatin versus carboplatin-based regimen in advanced squamous nonsmall cell lung cancer. J Cancer Res Ther 2017;13:198-203.